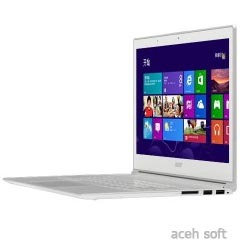 The Acer Aspire S7 has great quality and a refreshing exterior design scheme. The touch display is beautiful; its unique hinge design keeps it from wobbling too much. The keyboard is good; overall system performance is excellent. Our gripe with this Ultrabook is its overly loud cooling system. Other cons include an annoying power button location and a 4GB RAM limitation (most Ultrabooks are 8GB). The Aspire S7 has a refreshing exterior; the white pieces are Gorilla Glass and the silver is aluminum. The chassis bottom is matte white plastic. The Aspire S7 is exceptionally thin at just 0.47 inches and a lightweight at 2.87 lbs. This is one of the most solid feeling notebooks I've tested in some time; there's no flex anywhere. The attention to detail and general quality is outstanding. The aluminum pieces are precisely machined, especially the keyboard surround; it's all one piece with the rest of the palm rest and has a classy beveled edge. Even the speaker grilles and vent openings on the bottom of the chassis look great. The Gorilla Glass 2 on the screen surface is good for the touch screen aspect; I'm not too crazy about it covering the back of the lid though as it smudges up easily. The 11.6" version of the Aspire S7 uses an aluminum backing.